This article is about the fort known as Fort Detroit during the War of 1812. For the earlier fort by that name, see Fort Detroit. For other places named Fort Shelby, see Fort Shelby (disambiguation). Fort Shelby was a military fort in Detroit, Michigan that played a significant role in the War of 1812. It was built by the British in 1779 as Fort Lernoult, and was ceded to the United States by the Jay Treaty in 1796. It was renamed Fort Detroit by Secretary of War Henry Dearborn in 1805. The fort was surrendered to the British by William Hull in 1812, and reclaimed by the Americans in 1813. 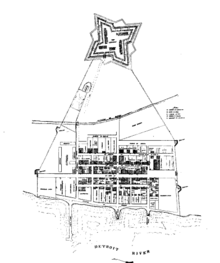 The Americans renamed it Fort Shelby in 1813, but references to "Fort Detroit" relating to the War of 1812 are to this fort, not to the earlier Fort Detroit, which had been abandoned by the British in 1779 in favor of Fort Lernoult. It was given to the city of Detroit in 1826 and dismantled in 1827. In the fall of 1778, Captain Richard Lernoult, the commander of the British Army at Fort Detroit, feared that that existing encampment would not be sufficient to defend against the oncoming American forces, who, under the command of Colonel Daniel Brodhead, had advanced to within ninety miles. He dispatched his second in command, Captain Henry Bird, to plan a new fortification on higher ground. Work commenced on the project in November 1778, and although construction was beset by problems due to severe weather, by October 1779 a total of 381 British troops were stationed at the new fort. The fort was constructed of a 4' high pile of tree trunks, topped with 7-8' long sharpened stakes, all of which were covered with an 11' high earth embankment, 12' wide at the top and 26' thick at the base. Outside of the embankment was a 5-6' deep ditch, 12' wide and containing an 11-12' picket. Although the British had promised to abandon their forts in U.S. territory following the end of the Revolutionary War in 1783, they continued to occupy six of them, including Fort Lernoult. President George Washington sent Chief Justice John Jay to London in 1794 to negotiate a resolution to this and other issues. The Jay Treaty called for the forts to be turned over to the U.S. by June 1796. The British abandoned Fort Lernoult and moved their forces to Fort Amherstburg on the other side of the Detroit River. The Americans occupied the fort on July 11, 1796, under the command of Colonel Jean François Hamtramck with 300 men. On August 5, 1805, Secretary of War Henry Dearborn sent a letter to Fort Lernoult's commander, Samuel Dyson, informing him that the fort's name had been changed to Fort Detroit. Michigan Territory Governor William Hull expanded the fort in 1807, building a higher (14 feet) stockade. Upon the outbreak of hostilities with the British in 1812, Hull was named a brigadier general and placed in command of the Army of the Northwest. Hull left Fort Lernoult on July 12, 1812 to undertake an invasion of Canada, which was abandoned after he learned that the British had captured the island Fort Mackinac. Sir, The force at my disposal authorizes me to require of you the immediate surrender of Fort Detroit. It is far from my inclination to join in a war of extermination, but you must be aware that the numerous body of Indians, who have attached themselves to my troops, will be beyond my control the moment the contest commences. Sir, I have received your letter of this date. I have no other reply to make, than to inform you that I am prepared to meet any force which may be at your disposal, and any consequences, which may result from any exertion of it you may think proper to make. The following morning, under cover from their batteries as well as the ships HMS Queen Charlotte and HMS Hunter, the British crossed the Detroit River and began advancing on the fort. As casualties began to rise, and fearing slaughter at the hands of the Indians, Hull surrendered the fort and all of its weapons, as well as two detachments of troops under the command of Colonels Lewis Cass and Duncan McArthur that were returning to the fort. 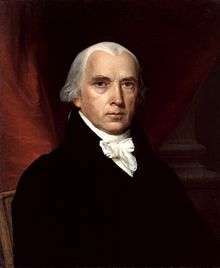 General Hull was court-martialed for surrendering the fort without a fight, and sentenced to be shot, but he was pardoned by President James Madison. The fort remained in British hands for over a year, until the Battle of Lake Erie. Following their defeat in the naval battle, and with General William Henry Harrison advancing on Detroit with 1,000 troops, the British retreated to the Canadian side of the river. 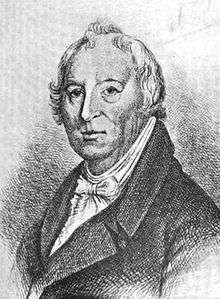 Duncan McArthur, by then a general, took possession of the fort on September 29, 1813, and the fort was renamed Fort Shelby in honor of Governor Isaac Shelby of Kentucky, who had come to the aid of General Harrison with a regiment of volunteers. The fort was occupied for the next 13 years, but fell into disrepair. Congress gave it to the city of Detroit in 1826, and it was demolished in the spring of 1827. Fort location overlaid on modern street map. 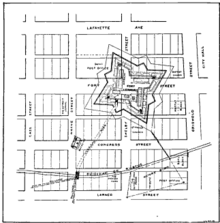 The fort was centered on the present-day intersection of Fort Street and Shelby Street in downtown Detroit, and bounded by Michigan Avenue, Griswold Street, W. Congress Street, and Cass Avenue. While excavating in 1961 to build the Detroit Bank & Trust Building, the remains of a wooden post from the fort were discovered. A total of over 8,000 artifacts were retrieved and are now housed at the Anthropology Museum at Wayne State University. Today, the site is occupied by the Theodore Levin United States Courthouse, the western portion of the Penobscot Building, the former Federal Reserve Bank of Chicago Detroit Branch Building, and other commercial buildings. ↑ Sources vary in their opinion as to whether the fort was actually renamed Fort Detroit by the Americans or was simply commonly called by that name. (Collins 2006, p. 36) says, "The fort's name was never popular, and invariably it was referred to as simply 'Detroit'" until it was renamed Fort Shelby. The State of Michigan Historical Marker on the site says, "In 1812, Fort Lernoult was surrendered to the British, but was regained by the Americans in 1813 and re-named Fort Shelby." Meanwhile, (Woodford & Woodford 1969, p. 72) says, "When the Americans took over, it was renamed Fort Detroit and so was known until after the War of 1812 when it became Fort Shelby." (Clements 1990, p. 368) cites an August 5, 1805, letter from Henry Dearborn to the commander of the fort stating that its name had been changed to Fort Detroit. This article takes that letter as authoritative.